Hello, world of Wrapunzel! I’m Nava – I am a graphic artist by day, and a musician by night. This is actually how I met Andrea a few years ago, and we have been great friends ever since. A few years after meeting Andrea, I was fortunate enough to meet my wonderful husband, Jonathan, and we have now been married for just over one year. My husband and I identify with a community where not all of the married women cover their hair every day, and this is what I have chosen to do because this is what usually makes me feel most comfortable . I always cover my hair on shabbat, chagim (Jewish holidays), and at Jewish events (such as weddings, bar mitzvas, bris’s, etc). I cover my hair at these events because I feel it is important for me to send a open signal to the community that I am a married woman, and it makes me feel more comfortable when I know I am making this clear (eg. not every guy does the finger check). I also feel that by covering my hair, I am acknowledging the religious importance of the event and am making an extra outward effort to show respect for that fact (rather than an inward effort) – just like I make an effort to wear nice clothing on shabbat and chagim to make these days special, I also want to cover my hair in beautiful ways for the exact same reason. As well as being a sign that I am married and devoted to my wonderful husband, covering my hair also gives me a way of portraying a membership to my community that I also love very much and am most grateful to have in our lives. I have always loved scarves and have been building up a collection for years. Before I was married, I always wore these scarves around my neck, but now that I am married, this is what I use to cover my hair! I love all of the different ties and combinations you can do – I really love mixing colours and textures, and using different accessories. Every dollar store or used clothing store trip is a treasure hunt for new accessories or scarves to add to my collection! I also love incorporating braids into my ties, I find them so wonderfully regal-looking. And since I was never really able to make beautiful braids in my own hair (since it is so curly and knotty), I enjoy having the chance to make braids in my tichels (headscarves)! ← Too Much Volume: Is There Such a Thing? I’m really interested in the idea of covering only for certain occasions. I expect to cover at Jewish events, but I’m hesitant to commit to covering all the time, especially as I am not sure what professional environment I will be working in, and in Europe (where I live) it’s not so usual. But I worry that to only cover sometimes would feel disingenuous, like presenting a false version of myself in both situations, either not as observant as I actually feel I am or as more observant than I actually live. Do you feel strange when you run into people in your religious community when you’re not covering, or your secular friends when you are? Do you ever feel like in covering (or not) you present yourself as more or less observant than you actually are? Do you feel more like yourself one way or the other? Do you think that if you were in a different community, you would make different choices about how you cover? Your wraps are so colorful and beautiful! And your bun is such a nice, natural-looking shape– do you have any tricks, or is that just your curly hair tucked in the back? For me, the way I dress is all about balance. I am very conscious of the issue you brought forward, “presenting myself as more or less observant that I actually am”. I do wear short sleeves and wear shirts with a lower neckline (but not too low! ;D) – and when I wear clothing like this, along with my head covering, I feel I am navigating a line where I feel comfortable and I am not broadcasting the wrong idea about myself. 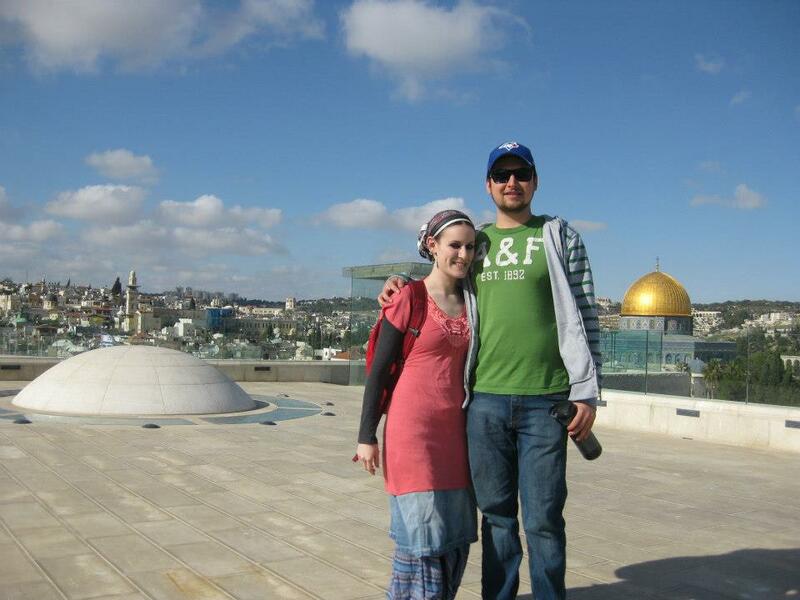 My husband and I were just in Israel (as you can see from some of my pictures :D), and as the trip went on, I grew more and more uncomfortable having my hair uncovered in Jerusalem. When we were in the old city, I always covered my hair for cultural and religious reasons, as well I would never want to visit the kotel without a hair covering. In Jerusalem specifically, it is a more common practice for married women to wear pants and cover their hair – and if I lived there, I feel this is what I would do because ‘hashkafically’ I feel this combination represents who I am very well. However, in the community where my husband and I live, women do not dress like this, and it would therefore make me uncomfortable to do so. Thank you so much for your wonderful compliments! 🙂 I do not have a volumizer, but what I do is make a high bun and wrap a scarf around the bun (making the bun look thicker and ‘pop out’ more), and then I do my regular ties over that! It gives a voluminous look, but not over the top – and you can place your bun wherever you would like (high/medium/low) and this trick will work in any position! You can let me know if you would like me to post a picture, and I am sure Andrea will let me 🙂 I hope I touched on all of your questions… I apologize for my post being so long. I’m so glad to read what you both have to say. i’ve recently started “part-time” covering and i feel I am struggling a little bit internally. trying to figure out how to explain my complexity (and to who i need to explain to anyway), which community to frequent, who’s saying things, etc. I’m really trying hard to “not care what people think” – but it is hard to avoid the feeling that you may not be presenting yourself in the right light. I love what you say, Nava about being “uniform no matter how you’re dressed”, that is a really good point and something I am taking with me for sure. It’s been a tad bit lonely for me on this road so, again, thank you so much for sharing. Happy to know I am not the only one that feels this way. Nava, do you wear pants still? I have gotten rid of a lot but there are a few I am hanging on to. I still wear jeans to work a lot (I work in a tough industry to go Observant “looking” in one step) – and I feel it is going to take forever to give them up. Just curious because of what you mentioned you saw in Jerusalem. Are you in the US? Thanks again! Yes, I do still wear pants. And there has only been a handful of times that I have gone in pants and worn a tichel here where we live in Toronto, Canada. This is a more common practice in the dati le’umi community in Israel, I think specifically in Jerusalem. And as our visit there progressed, this is more and more how I felt comfortable. I began to feel uncomfortable going out without my hair covered, even though I did feel comfortable in pants (unless we were going to the Old City – then I always wore a skirt). I do feel that this way of dressing represents me best in the way that I hold in regards to how I would like to present myself. But in the city where we live, I have never seen women (even in my community) dress that way, and I feel that if I did, I would be attracting unwanted attention, and people would not understand the statement that I was projecting about myself – they would just feel confused (unless they are Jerusalemites, or spent alot of time there… but even then…). Women in the community that I identify with in Jerusalem dress this way, and that is why I feel if I lived there, I would probably dress that way as well. But in the community we identify with here, some women cover their hair partially, some fully, some not at all… some wear pants.. some don’t.. and I feel that the way I dress represents where we ‘fit in’ to the community. There are also ways of making pants more ‘tznius’ without giving away the comfort/mobility/feel/etc…. you can wear a short dress over pants, or a tunic (so you don’t show the outline of the top of your leg, only from the knee down). You can also wear a knee-length skirt over pants… but in the workplace, wearing a nice summer dress or tunic would probably be the ‘easiest’ way to dress a little bit more modestly a little bit more ‘inconspicuously’. This was also a consideration of mine before I married my husband, and I considered taking on a similar practice (I also didn’t want to give up pants! ), but I also decided against it basically for the same reason that I don’t wear pants and cover my hair – women in my community simply don’t dress that way. I will sometimes wear a knee-length skirt over “harem pants” (ie Aladdin pouffy pants) on shabbat – great for picnics or a day when you’ll be doing a lot of walking! Very comfy, too! This is probably a whole blog post it itself, but as an almost life-long make-up hound, I’m curious about your eye makeup, Nava. The pronounced under eye liner (shadow or kohl) without balanced upper-eye liner is for me, unique amongst observant women. It seems to be a cross between a football player’s facial markings, the racoon look that Ellen Degeneres once did a send-up of, or simply a goth-girl’s night out. That said, you seem like such a fabulous young woman so I’m wondering if….there’s something I’m missing here! To that end, can you please explain your eye make up choice, how it plays into your Jewish observation, and how Jerusalemites respond? Thanks! People from all walks of life tend to ask me about it or notice it, not only observant people. And I give everyone the same answer… basically the same answer that I gave you 🙂 And as I mentioned in my other post, I do try to give off the message to people who see me and see the way that I dress that I feel most comfortable in the dati le’umi community, and I think adding a little bit of funk into my look as long as it is appropriate is ok! I love looking for things that are different.. and colourful… I love Indian clothing and shopping in the shuk! Whenever we are in Israel, I stock up on scarves and skirts. We just came back a few weeks ago, and what can I tell you… mission accomplished 🙂 I was lucky enough to pick up some fun earrings, too! OK, I get it. Of course I do; I’ve been an iconoclast all my life and over the past several years have likewise favored a middle-eastern palette. But that usually includes Angled Kohl or eyeliner above the eye as opposed to under. So I don’t come to you as a frummy-frum Ortho woman in sensible shoes and bad helmet sheitel; I come as a edgy, eclectic style-junkie hipster I guess 😉 Someone who saw the heavy LOWER lid kohl streak as chalkboard-chalk thick and therefore bottom-heavy. OK, now back to teichels……. I just received my Judith deParis volumizers so I’m now ready to start rockin’ the mitpachat casbah, folks! You hit the nail on the head Madalena!! I am on the same path of finding the right balance. You ladies are inspiring!! My “look” has always had a slight edge to it so my attempt has been to refine it. To be a a more refined jewish woman. Does that make sense? Well that’s my personal journey I suppose.